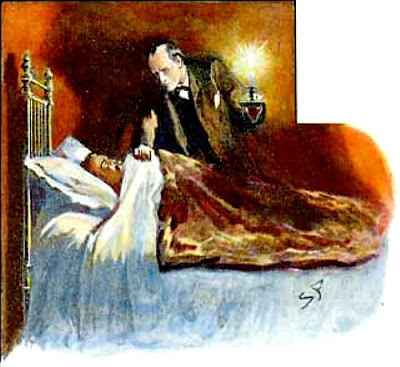 In Commentary Terry Teachout reviews "a new collection of Holmes stories—homages, pastiches, parodies, [and] spoofs...": The Big Book of Sherlock Holmes Stories and considers what accounts for the enduring popularity of Holmes and Watson. What keeps Sherlock Holmes alive? As is customarily the case with serial literature, the most important element of the appeal of the Holmes stories is the personality of their principal character, closely followed by his relationship with his amanuensis. Saturnine, sardonic, and inexplicably indifferent to women, rational to a fault yet afflicted by an ennui so profound that he must resort to cocaine in order to dispel it, Holmes is the very model of an English eccentric, exotic everywhere but in his native land. Teachout's final judgement is that the original stories by Conan Doyle are not "classic—merely memorable."